This beautiful, artistic and hand crafted Hanukkah metal menorah, or hanukkiyah, from Lily Art is constructed to the traditional style with the modern flair. The base, as well as the upper section of the every other branch has a gold/yellow and red patterned finish. Two replica ancient coins are attached with a beaded string. As a finishing touch to this classy yet unique menorah, a silver colored metal Hanukkah dreidel is attached with a beaded string from the center branch. 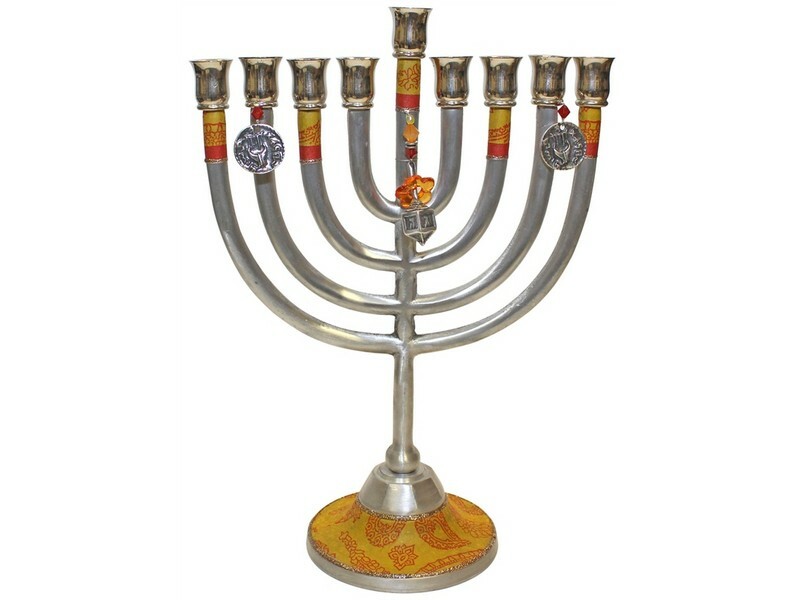 This nine branched menorah has the middle “shamash”, or helper, candle built from the base, towering above the other eight branches. The eight other branches, presenting the eight days of Hanukkah, are crafted, four from both sides, from the center branch in a semicircular shape upwards where all eight end at the same height.